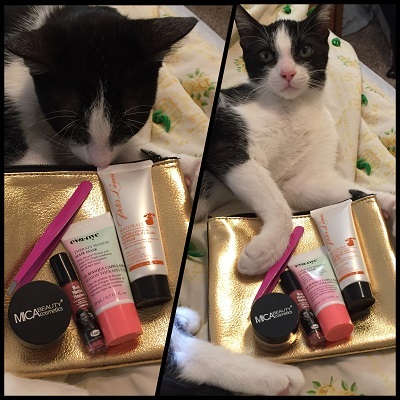 I forgot to talk about my Ipsy glambag last month, so I thought I’d do a little joint review of October’s and November’s glambags. And, just as a shameless plug, if you want to sign up for Ipsy after reading all this, please use my referral code. It wins me points. Hee. 1. Eva NYC Therapy Session Hair Mask – With an argon oil base, this isn’t much different from, say, Garnier Fructis Sleek and Shine conditioner. Slightly different scent, but not something I’d pay for extra. Three stars. 2. MicaBeauty Cream Eyeshadow (Bronze) – I’ve never used cream eyeshadow before. This was awesome. Loved it, loved the color, loved how easy it went on and how long it stayed without clumping, without even putting a base down first. Five stars. 3. Emite Professional Slant Tweezers – I don’t use tweezers often, and this seemed at first glance to be much better quality than the ones I have. Unfortunately, in trying to use these, it turns out they aren’t good for fine hair, and just break the hair. Nope. They’ve gone into the first aid kit for splinters. One star. 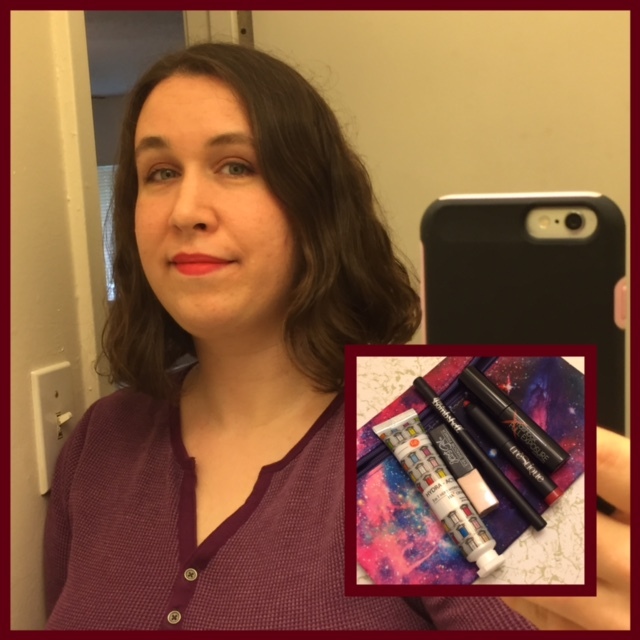 4. theBalm Cosmetics Meet Matt(e) Hughes Long-Lasting Liquid Lipstick (shade: Committed) – I was leery of this one, because my first experience with liquid matte lipstick was Revlon’s ColorStay, and that dehydrated my lips so badly that they were bleeding (literally) within a few minutes. This one, thankfully, wasn’t like that. Went on smooth, stayed smooth without any stickiness (Revlon was sticky), and after it dried I couldn’t even tell it was there. Nice color, and a faint scent of peppermint. Awesome. Four stars. 5. Peter Lamas Exfoliating Pumpkin Facial Scrub – My thoughts were, “Autumn, pumpkin, I guess?” But this did not smell like pumpkin. First off, it was better than any scrub I’ve ever gotten in stores, with more of those little exfoliating scrapper dots (I’ve no idea what they’re really called, and yes, I know I’m ignorant) in much smaller sizes. After scrubbing, my face feels fresh and new in a way no other product has ever made it feel. Bonus: The scent is amazing. Not pumpkin, like I said, but something reminiscent of walking into a Dunkin Donuts when all the pastry has just come out from the oven. Mmm… Five stars. The bag as a whole: While I didn’t like the actual bag (bronze one one side, black on the other), I did enjoy most of the products within. And even bought a full-size version of that Peter Lamas scrub. 1. Be a Bombshell Mechanical Eyeliner (shade: Wild Child) – This eyeliner is waxy and while it seems like it’s supposed to be a kind of black, instead it’s a weird grey that doesn’t go on smoothly. I’m not very familiar with eyeliner, so maybe that’s just the way it’s supposed to look. In any case, considering this is the third eyeliner Ipsy has sent me, I never see myself needing to buy more! I have three colors now. Yay! Two stars. 2. Jesse’s Girl Eye Shadow Primer – I have some primer, but it doesn’t hurt to have more, and this seems better quality than the kind I have. Less powdery, more liquid. Does its job, too. Four stars. 3. tre’Stique Mini Matte Crayon (Chile Red) – The crayon itself is a good texture and easy to apply. The color is WAY too bright for me (brighter in real life than it is in the pic). However, I found that if I pair it with a layer of L’Oreal’s Sandstone (sort of a bronze, shimmery neutral), it transforms into something I can use. Cool. Three stars. 4. Smashbox Full Exposure Mascara (Jet Black) – Not too thick and the wand is easy to use, and gives a slightly different effect from my normal mascara. I like it! Four stars. 5. Figs & Rouge Hydration Cream – I can’t quite identify the fragrance of this one. Something light and floral, like lilies, barely noticeable, and not chemical at all. The cream soaks in fast, so it doesn’t leave me feeling greasy afterwards, and a little bit goes a long way. Definitely my favorite part of the bag this month! Five stars. The bag as a whole: I really like the actual bag this time. It’s soft and pliable, whereas all the others I’ve gotten so far have been plastic or stiff. It’s also very pretty. It’s the first one since my first hounds-tooth Ipsy bag that I’ve kept. And while this month’s shipment wasn’t quite as good as October’s, it still have a product I love in it, and no products I hated. Yay! Once again, please use my referral code above if you’d like to sign up. Personally, after four months with Ipsy, I’m super pleased with what my $10/month gives me. I don’t always enjoy everything, but I often enjoy a lot, and I learn so much that I didn’t know beforehand (about brands, products, colors, etc) using all these little samples. It’s fantastic. Oh gosh, I’m so tempted to join Ipsy, but I also worry that I’m going to end up with a bunch of stuff that I never use taking up space in my makeup bag. My thoughts on that are 1) they actually do a good job giving you things you’re interested in (you fill out a questionnaire beforehand) and 2) I continue following the KonMari method – if it’s something that I won’t use and doesn’t bring me joy, I toss it. The $10/month has been worth it for the parts I keep. I *just* received my November bag today. It looks like we got many of the same things. I have yet to try the lip crayon, but my first thought was that it was definitely bright. Maybe a good one for a holiday party? I know exactly what you mean about the tweezers. I received a pair in one of my first bags and promptly gave them to one of the kids. I don’t think I managed to pull a single hair. It just sliced them off no matter how careful I was. I will stick with my cheap but highly effective Revlon tweezers. I’m glad I’m not the only one who had that issue with the tweezers!! I thought I was just clumsy or something.